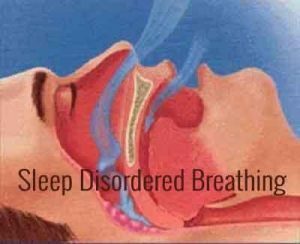 Sleep disordered breathing (SDB) constitutes a spectrum of disorders of various severity with intermittent snoring as the mildest form at one end and obesity hypoventilation syndrome (OHS) , the most severe form at the other end of the spectrum. Heavy snoring and upper airway resistance syndrome (UARS); mild, moderate and severe sleep apnea lie in between these two extremes. Because of the uncertainty about what constitutes sleep apnea, the term SDB is used to describe events that do not satisfy criteria as apneas and hypopneas according to the conventional criteria, but which carry some of the same consequences, like, snore-arousals or respiratory effort-related arousal (RERA) or flow limitations. Respiratory effort – related arousal (RERA): is an event characterized by increasing respiratory effort for > 10 seconds leading to an arousal from sleep, but which does not full fill the criteria for hypopnea or apnea. Respiratory Distress Index (RDI): is defined as the number of obstructive apneas, hypopneas, RERAs and flow limitations per hour averaged over the course of at least 2 hours of sleep as determined by nocturnal polysomnography (PSG). The term apnea-hypopnea index (AHI) is most commonly used conventional criteria to diagnose and quantitate the severity of sleep apnea, however recently as per the guidelines of American Academy of Sleep Medicine (AASM) the term respiratory disturbance index (RDI) is increasingly used to diagnose and describe SDB which includes besides apneas, hypopneas other events such as RERAs, and flow limitations. The newly revised International Classification of Sleep Disorders defines OSAS as when a patient has an RDI of five or more than five per hour of sleep with the appropriate clinical presentation such as excessive daytime sleepiness, un-refreshing sleep, fatigue, insomnia, mood disorders or other neuro-cognitive disturbances. The severity of SDB is assessed by the number of abnormal breathing events per hour of sleep, degree of sleepiness and the degree of oxygen desaturation during sleep. The prevalence of SDB varies from region to region. It has been found to be present in 4% of men and 2% of women. In India various studies have shown the prevalence of SDB of 2.6% to 4.9% in adult males and 1% to 3.6% in adult females. About 4.8% children and 10.3% of elderly population in India have SDB. No gender difference in the prevalence of SDB has been observed in children and elderly subjects. The factors associated with the pathogenesis of SDB include anatomically small airway, obesity, and loss of upper airway motor tone during sleep and dysfunction of central respiratory control. The various risk factors are body habitus (especially percentage of predicted neck circumference), obesity, genetics, craniofacial morphology, chronic rhino-sinusitis with nasal obstruction, smoking and alcohol consumption. The diagnosis of SDB depends on properly taken history from the patient and the bed-partner regarding the typical daytime and night-time symptoms. Comorbid conditions like hypertension, diabetes and other metabolic and hormonal problems. Good physical examination taking into account body mass index (BMI), neck length, percentage of predicted neck circumference (PPNC), cranio-facial anomalies like micrognathia and retrognathia, and evaluation of the upper airway using clinical examination scores, eg. Friedman score, X-ray cephalometry, CT scan, MRI, and videoendoscopy. For the localization of the site of the obstruction multi-channel pressure measurement has also been used with some success. The gold standard test for the diagnosis and severity assessment of SDB is clinical polysomnography (PSG); however, there are many practical considerations and clinical caveats in PSG interpretation in sleep related sleep disorders. History should include any history of sleep problem, sleep diary, medication history, medical problems, work history-shift work, alcohol or drug use, periodic limb movement disorders, dream history and teeth grinding. Physical examination should include measurement of body mass index (BMI; kg/m2 ), neck circumference and waist/hip ratio, examination of nose, oral cavity, oropharynx, bony structure of head and neck. Sleep endoscopy is rarely needed to confirm airway collapse. Requirement for standard diagnostic nocturnal polysomnography (PSG) includes recording and analysis of the following parameters: EEG, (EOG), (EMG), oro-nasal airflow, chest wall effort, body position, snore microphone, ECG, and oxyhemoglobin saturation. The duration of a diagnostic NPSG is at least 6 h with the exception of the diagnostic portion of a split-night study, which is at least 2 h in duration. Symptomatic patients with negative portable studies. AHI > 40/hour of at least 2 hours of sleep. AHI between 20 and 40 in the presence of repetitive lengthy obstructions and major de-saturations. CPAP titration must be carried out for more than 3 hours. PSG documentation of abrogation of all events with CPAP. All modes of treatments should be discussed and these include behavioral treatments, use of oral appliances, positive airway pressure (PAP) therapy and surgical therapy while providing real information about success with each mode of treatment. Can reduce or eliminate OSA without the need for medication, device use or surgery. Continuous positive airway pressure (CPAP) is the gold standard for treatment of OSAS. It acts as a pneumatic splint to keep airway patent. The benefits of CPAP include the following. Patient should be evaluated for awake respiratory failure, congestive cardiac failure, and marked nocturnal hypoxemia. CPAP titration should ideally be done in the hospital under supervision of a trained technician. CPAP should be increased till all the obstructive events: apneas, hypopneas, RERAs, snoring and desaturation dissapear. CPAP pressure of 1 cm H2O should be increased with an interval no shorter than 5 min. Requires close supervision by trained technician or physician while commencing CPAP. Many patients might require endotracheal intubation or urgent tracheostomy. The patient may become confused or delirious due to deranged blood gases. In trained hands, judicious use of CPAP or BiPAP can control breathing disturbances. X-ray cephalometry, CT and MR imaging, video endoscopy under sedation and multi channel pressure measurements. Patient’s expectation regarding cure of their snoring, apnea and symptoms of tiredness. Procedure on the upper airway, which may improve PAP use and compliance. Nasal surgery for hypertrophied turbinate, deviated nasal septum or nasal polyps. Bariatric surgery has a potential to reduce body weight significantly as a significant number of OSA patients are obese. Interventions should typically be applied in the order listed. Proceed down the list until success is reached. Follow-up after medical and surgical intervention is critical to ensure that the patient has benefited from the chosen treatment and to provide an opportunity to implement further recommendations in case partial treatment response.